Forum Index > Historical Arms Talk > Carrying multiple weapons at the same time? Posted: Thu 15 Jun, 2017 3:25 pm Post subject: Carrying multiple weapons at the same time? Just curious if you could point me to any period illustrations showing men at arms and knights in the medieval period carrying more than one weapon? For example, two swords, a falchion and an arming sword, etc. I'm not saying dual wielding, just referencing a very well-equipped knight, for example, who might be packing a little extra. Or, where a knight in a prebattle situation might be choosing between multiple swords. I know I've seen some but can't find them in my image library. No that doesn't happen just like you don't see people with 2 rifles today. All swords are much of the same, there no reason to carry 2. Now you might carry a small short sword and a big two handed sword. But the short sword is a back up weapon. Are you specifically looking for two+ swords, or just multiple weapons in general? These are all just quick google image search. I'm sure you could find more with a bit more digging. I'm sure there's also plenty of other people on these forums who could give you more information. However, again, specificity over whether you're looking for specifically multiple swords, or any combinations of multiple weapons would help in the providing images and whether what you're looking for exists. 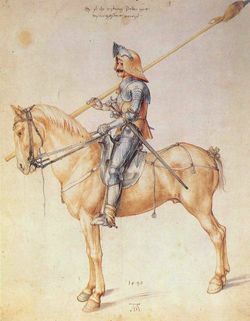 It was common for cavalry soldiers to carry lots of weapons. For example, some 16th-century Spanish men-at-arms carried lance, estoc, arming sword, hammer, and dagger. 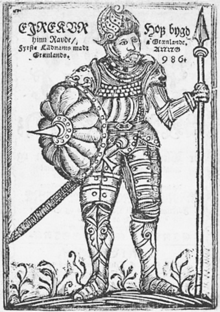 Lance, sword, and mace was the iconic French standard for men-at-arms. 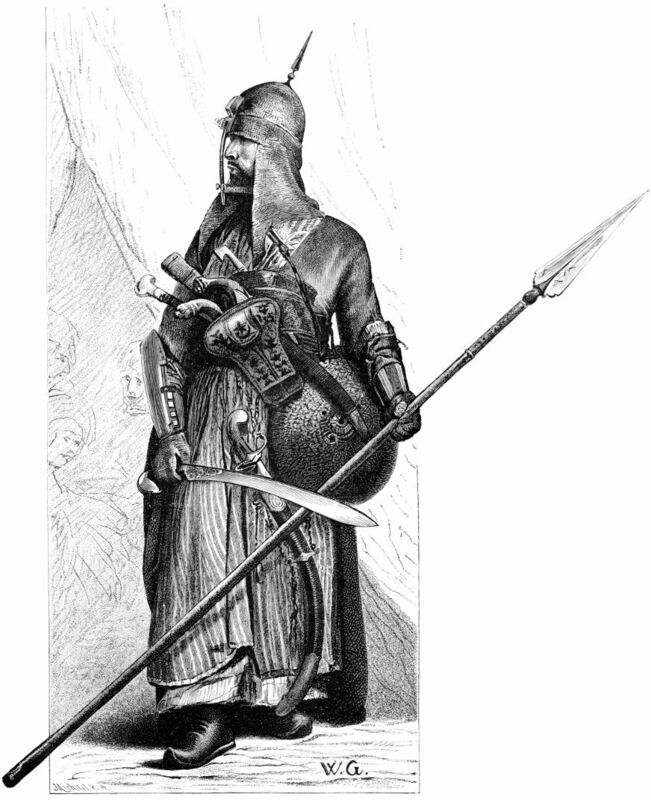 Turkish and other steppe-style cavalry might carry bow, lance, saber, mace, and dagger, sometimes with an arquebus as well. There is an old Persian (I believe) instruction manuscript that instructs Calvary men to use first their lance in battle, then their mace, and lastly their sword. 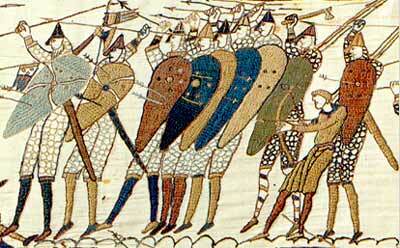 Here's the portion of the Bayeux Tapestry which shows the saxon on the far left carrying a spear, sword, shield, and daneaxe. The 13th century Scandinavian "King's Mirror" recommended that a knight have two swords, one worn on his belt and one attached to the saddle. 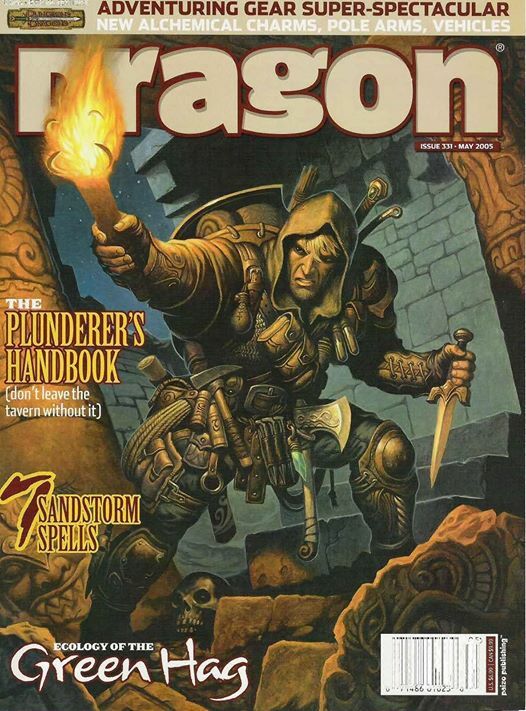 I seem to recall there was a myArmoury thread with a couple of depictions that showed this but I can't seem to find it. That goes back to the Late Bronze Age when you can see chariots festooned with all kinds of spare weapons from hatchets and quivers of darts to spears. In the renaissance rich men often had a train of servants to carry a rotella, some staff weapons and firearms, etc. (Or think of "gun bearers" in the Raj and 19th century expeditions to Africa). There are also a few cases where festooning yourself with impractical numbers of weapons becomes 'cool' ... Ruel Macareng talked about that. But if they have to carry/handle them themselves, the vast majority of men pretty quickly pare down the list to no more than two sidearms, a shield, and a long staff weapon (or bundle of small ones), and carrying two slightly-different swords is more bothersome and less practical than carrying a long sword and a short dagger. 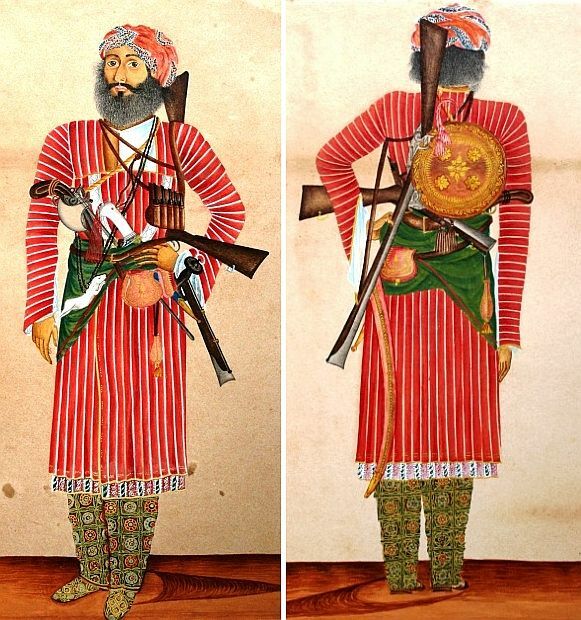 Not uncommon in Indo-Persia for a warrior to carry multiple weapons. Firearms are a different matter as the reload times for muzzle loaders make carrying a spare pistol a wise idea.